Costa Serena arrived at her new home port of Shanghai this morning, expanding Costa’s capacity in the region by 74%. She is joining Costa Atlantica and Costa Victoria year round in the Shanghai market. The complete story appeared in the April 25 edition of Cruise News Daily. The Royal Caribbean crew member who holds the distinction of being charged with the first sexual assault aboard Quantum of the Seas (with only a month in service) has entered a guilty plea in the case, and will be sentenced in August. He was also the first crew member from the new ship to be arrested. Details appeared in the April 24 edition of Cruise News Daily. Last month we told you that when MSC Seaside is delivered in 2017, it was going to be assigned to the Caribbean year round and homeported in Miami. 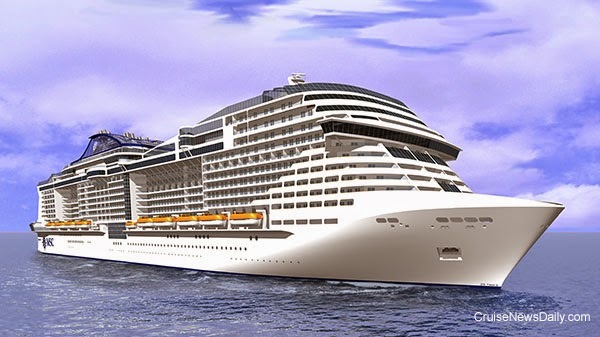 Now the line has decided that it just can’t wait that long to have a year round presence in Miami and said yesterday MSC Divina will also be homeported at Miami year round beginning this fall. The complete story appeared in the April 23 edition of Cruise News Daily. The newest addition to Seabourn’s fleet is Seabourn Encore, and it’s interior is being designed by noted hospitality designer Adam Tihany. Seabourn has released the video below where you get to spend a few minutes with Tihany and he tells us about the process and what he has in mind for Seabourn Encore. The industry has always been able to count on Norwegian Cruise Line to come up with interesting twists and put their own imprint on their markets. So today they shook up the short cruise market to the Bahamas from South Florida, by including drinks in the price of their three- and four-night cruises aboard Norwegian Sky to the Bahamas beginning in January. Details appeared in the April 22 edition of Cruise News Daily. It hardly seems possible, but Disney Dream is already four years old, and this fall when it goes into dry dock (October 4-24) it will be refit it will be time for some major new features to be added. One that would excite lots of adults, will only be available to the kids aged 3-12 because it will be a major addition to the Oceaneer Club. The new area, called Star Wars: Millennium Falcon, lets the kids play on the bridge of the spacecraft from the legendary movie series. They will join the battle for good by assisting with the navigation of the powerful spacecraft, and can pilot the spaceship through hyperspace and trigger lightspeed jumps to different locations around the galaxy. The complete story appeared in the April 22 edition of Cruise News Daily. 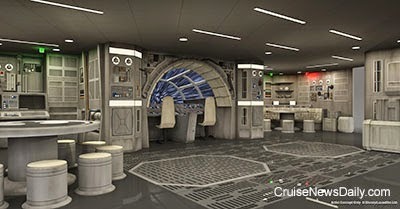 Image courtesy of Disney Cruise Line. All rights reserved. May not be copied or used without permission. In yesterday’s call to discuss Royal Caribbean’s first quarter earnings with analysts, there seemed to be two topics of discussion that kept coming up repeatedly: discounts offered close in to sailing - or the lack thereof, and the strength of Quantum-class bookings. The complete article appeared in the April 21 edition of Cruise News Daily. All the shipyards must have new plasma torches and can’t wait to use them. In the last few weeks there’s been a lot of steel cut for new ships, and today, STX France cut the first steel for the first of MSC’s Project Vista ships, MSC’s largest ship to date, which the line said they have named MSC Meraviglia. This shouldn’t be confused with the Seaside ships Fincantieri is building for MSC. The Project Vista ships will be bigger. Image courtesy of MSC Crociere. All rights reserved. May not be copied or used without permission. SANTA CLARITA, Calif. (April 20, 2015) - John Chernesky has been appointed to the role of vice president, North America Sales for Princess Cruises and Cunard Line, effective June 1. The Princess Cruises veteran succeeds Brian O’Connor who was recently appointed vice president, public relations for the cruise line. In his new role, Chernesky will lead the field sales team representing both lines to professional travel retailers throughout the United States and Canada. Chernesky, who has been with Princess Cruises for more than 22 years, most recently served as vice president, onboard revenue and business development for the Holland America Group, where he supported Princess Cruises, Holland America Line and Seabourn. In this position, he was responsible for product development, strategic analysis and creating growth opportunities for spa, fine arts, casino photography, media production, shipboard communications technology and branded credit cards. Ho added that a key part of Chernesky’s role will be to provide strategic marketing guidance to help retailers increase their cruise sales with Princess and Cunard. From 2009-2013, Chernesky served as director, onboard revenue and product development. Since joining Princess Cruises in 1992, he has also served in the hotel services department, helped manage the design development of numerous new-builds and served as director, passenger programs overseeing the youth and teen programs, onboard media and enrichment programs. He holds a B.S. degree in business administration (marketing) from Miami University in Oxford, Ohio, and completed an executive leadership program at UCLA’s Anderson School of Management.